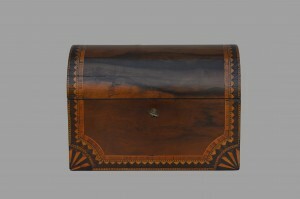 This Federal tea caddy in an unusual dome-top form has exquisite dark and light inlays with rosewood veneer. The interior is completely lined with satin-wood and has 2 square compartments for tea, each having satin-wood covers with ebony knobs. American or English. Width 8 3/4 in. Height 6 1/4 in.